The intersection of two human impulses – play and profit – was at the center of an entertaining and informative Mitchell Lecture on Oct. 8 in O’Brian Hall. The speaker for this year’s address, the Law School’s signature lecture series, was Madhavi Sunder, a leading scholar of law and culture who teaches at the University of California Davis School of Law. Sunder studies intellectual property law, a once-staid field that has blossomed into new possibilities with the advent of digital technologies. Professor Mark Bartholomew, who chaired this year’s Mitchell Lecture Committee, noted that the success or failure of IP law has long been judged on a single axis: whether it provides the incentive for writers, artists and filmmakers to produce more creative work. Sunder, he said, has broadened that perspective, bringing into the equation the perspectives of human rights, free speech and social well-being. And make no mistake, she said, big money is involved. Movie-related merchandising is now a $100 billion-a-year industry, one that grew exponentially after the first Star Wars film in 1977. Sunder reviewed some important cases in the laws governing who has the right to produce movie-themed merchandise. The current law has its roots in a 1980s case brought by Warner Bros. over products related to the Dukes of Hazzard television show. An appellate court ruled that because the studio had a substantial financial interest at stake, it alone had the legal right to license toys based on its show. Exercising that right has sometimes come at a cost in goodwill, Sunder said, as in 2009 when Warner Bros., holder of the Harry Potter license, sent a cease-and-desist letter to a single mother in the United Kingdom who was planning to host a Harry Potter-themed dinner party, serving butterbeer and pumpkin soup, and charging admission. In a similar case, the music licensing firm ASCAP was roundly derided for attempting to collect fees from a Girl Scout summer camp where campers sang Puff, the Magic Dragon and Over the Rainbow around the campfire. The concern, she said, is that companies’ heretofore laissez-faire attitude toward fans’ use of their properties may fall victim to a push for ever-greater profits. “Today,” Sunder said, “management scholars ruthlessly advise companies that ‘more experiences should yield transformation’ and that companies should ‘charge for life-changing experiences.’ Management gurus offer that ‘the greater the positive memory created and the longer it lasts, the more value is created,’ with value meaning profit. … My studies suggest that we should fear the creep of trademark law into our lives, especially where property law increasingly seeks to govern arenas fundamental to our humanity, such as play and learning. 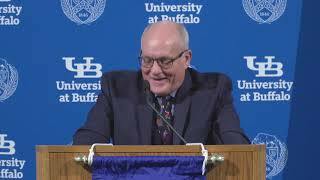 SUNY Buffalo Law School’s most prestigious lecture series, the Mitchell Lecture was endowed in 1950 by a gift from Lavinia A. Mitchell in memory of her husband, James McCormick Mitchell.